Close to My Heart has a new idea book so our team has decided to showcase the new products in our team, Stampers with an Attitude, Blog Hop! If you have come here from Vickie's Blog, you are on the right path! The blog hop is a great big circle, so you can start here and work your way all around. Just click on the link at the end of the post on each blog to move to the next one! If you get lost along the way, you’ll find the complete list of participating consultants at the end of this post. My team--Stampers with an Attitude are excited to show you some of our new products with attitude. I used the Huntington Paper pack to make the card. I used the bamboo cardstock to create the card by cutting it to 8 1/2 x 5 1/2. Then I cut the background and texture paper (that's what we call the patterned paper). Our papers are printed on both sides with different patterns so you get a lot of bang for your buck and fun patterns to play with. Then I cut the cocoa paper. (I am moving right now and could NOT find a cricut cutting mat, I really wanted to use the cricut to cut this shape but had to rely on good old scissors to do it myself, can you belive it, I didn't like it one bit!!) 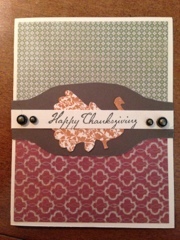 I stamped the turkey using autumn terracotta ink and cut it out as well and attached it on top then stamped Happy Thanksgiving on strip of bamboo and put it on top and then used our fun self adhesive artisan studs on each end. It's a very fun, simple card. I'm going to make some more!! My friend and fellow consultant, Keri Lines, www.kerispaperplayandinkyfingers.ctmh.com, is here visiting and helping me to move from Washington State. She made this fun card using Laughing Lola Paper pack. You cut that by hand? You are better than me! Love your card. LOL, Thanks Melinda, but I doubt it! Love your cards Kim. 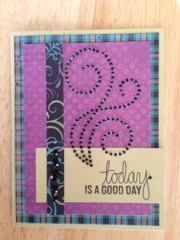 Especially love the card your friend made using the Flourish sparkles and the Laughing Lola papers. Thanks for sharing. Keri is an amazing artist! Thanks S'andra! Hope things are going better for you! Love that new turkey. I need to get him out and play with him. Thanks Sheila! I love the set! I need to remember to photograph the stamp set as well! Good luck as the school year starts! Thanks Jen, it was an adventure! I can't wait to unpack it all and then figure out where everything is, still working on the kitchen, lol! Fabulous cards! I may have to lift the Huntington one for my last swap. :D I was planning on using that stamp set and the artisan studs! Thanks Pam, I think Huntington is my favorite paper pack (at the moment), LOL!! I LOVE the artisan studs! I love the simplicity of your card. Nice job! Thanks Christy! I love simple and easy to duplicate! I love the cards!! Keri you are an awesome friend to come help out Kim!!! Germs and all! Your card is also beautiful!! Thanks Beth! I'm lucky to have a great friend like Keri! There are no mistakes - just happy accidents. Nobody would have noticed the brown was a little wonky if you hadn't mentioned it. Both cards are great. Thank Marylou! You are very kind! But we all need the cricut! LOL!! You know what they say about necessity? Limited supplies just help us get back to basics, love them.